Design Details : A unique Pentagon shaped glass jar hosts an eclectic collection of succulents. Size Details : Height: 7″ and Opening 4″ with Succulent plants. Size Details : Bulb Height: 9″ , Width: 6″. Design details : 3 ideal terrarium plants and an elf in his mushroom will enliven your room with this. Jar Terrarium : A terrarium is a collection of small plants growing in a transparent, sealed container. Inside a terrarium’s walls, many natural processes may be observed: photosynthesis, respiration and the water cycle. This little jar contains an entire universe in itself. Pruning: Some plants tend to grow a little too much, usually happens when there is less light. In such cases, you can prune these run-away stems. Design details : This medium sized miniature Jade is planted in a large black oval Indian ceramic pot. Miniature Jade (Portulacaria Afra) : These are pretty identical to Jade plants . They are ideal to be gifted as house-warming plants and are supposed to bring good luck. The fact that these lovely plants are not at all demanding, seem to add to their appeal. Purple Beauty (Sempervivum) : Perennial succulent herbs that grow in very tight rosettes and produce babies close to the mother regularly. This exquisite beauty in black purple is planted in a brown Indian made ceramic pot. Light: Place in full sunlight. The edges get a better color with full sun. Repotting: This is not normally needed, but if the plant has produced lots of offsets or it has outgrown its pot it’s a good idea to repot in Spring. Propagation: It produces plantlets close to the mother. Use this to propagate. Flowers: In late summer evenings, mature plants produce bright flowers. Window Stars (Haworthia Glauca) : Haworthia are very elegant and slow growing succulents. They thrive in desks and offices near well lit windows. Light: Moderate light is needed. But never in deep shade. Watering: Very low watering. Haworthia is more tolerant to under-watering than over-watering. Water once a week. Feeding: A weak all purpose feed once in 2 months is more than sufficient. Propagation: It produces babies close to the main plant. Use a sharp knife and separate them from the main plant to propagate them. Flowers: Blooms in Summer evenings. Design details : This hardy pot is planted in a white ceramic pot. Size details : Height: 7″ with plant. Pot: 4″ wide; 3″high. Zebra Cactus: Is planted in a beautiful white ceramic pot that sets off the stripes of this eye catcher! Watering: Water once a fortnight. Tolerant to underwatering … but hates overwatering. Paddle Plant (Kalanchoe Thyrsiflora) : They are unusual succulents that have flat round leaves arranged in rosettes. The edges of these flat leaves gain a red colour when exposed to good Sun! This beauty is planted in an Indian made brown ceramic pot. Light: It can survive in full light as well as bright lighting. Mini Terrarium : A succulent terrarium is a collection of small succulents growing in a transparent, open container. Inside a terrarium’s walls, many natural processes may be observed: photosynthesis, respiration and the water cycle. Sunlight: Place your mini terrarium in a bright area with indirect sunlight, (ex. windowsill, well-lit workstations). These terrariums are a closed system; it can get too hot if placed near a direct heat source and the plants may burn. Water: A properly maintained terrarium can go for weeks or months without needing water. Pour a half cup when the soil color turns to a lighter brown. Design details : An eclectic mix of succulents in a white ceramic pot. Size : Height: 6″ with plant. Pot: 4″ wide; 3″high. 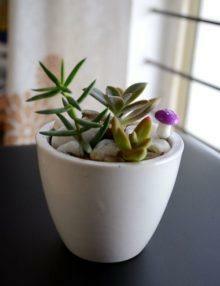 Succulent Pot: Is an eclectic mix of small succulents in a white ceramic pot. Feeding: A weak all purpose feed once a year durinf spring is more than sufficient. Re-potting: If the plant has outgrown its pot it’s a good idea to repot in Spring or to pluck out its baby plants. Watering: Succulents live in arid environments and need very little water, especially when grown in a terrarium. You can spray them with a light mist every week, or water them every other week with a tiny bit of water by dripping water near the roots. It is much better to underwater than overwater these plants, as overwatering can lead to rot, which will kill the plants. If the plants are not getting enough water, their leaves may start to shrivel and droop a bit, but they recover quickly once you water them. Light: Succulents like plenty of indirect light. They do well placed near a window that gets only indirect light for most of the day. Too much direct sunlight will burn the plants as the terrarium can get very warm. Maintenance: Succulents require little maintenance. To discourage rot, it is best to remove fallen leaves from the terrarium. It is also good to allow the terrarium to receive fresh air from an open window when the weather allows. Hanging Orb (Open Terrarium) : A terrarium is a collection of small plants growing in a transparent, sealed or open container. Inside a terrarium’s walls, many natural processes may be observed: photosynthesis, respiration and the water cycle. These hanging orbs creates a unique ambience at your living spaces. Watering: This pear shaped glass terrarium has one Fittunia plant. This needs to be well watered. A light mist or direct watering will be needed based on evaporation. It may vary from 2 days to once a week. Light: This plant like plenty of indirect light. They do well placed near a window that gets only indirect light for most of the day. Too much direct sunlight will burn the plants as the terrarium can get very warm. In case of little light, the plant elongates in its search for light. Maintenance: Needs little maintenance if well lit and watered. Trim longer leaves and remove fallen leaves.